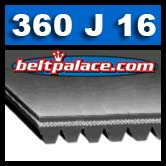 360J16 POLY V. 16-PJ914 Micro-V Belts. 36" Length. The number following the 'J' designates the number of Ribs. (Measurement shown is for Outside Circumference.) Our biggest seller for multiple applications. 360J-16 V-ribbed belts are designed to replace OEM belts on extra heavy-duty applications. Replaces PRECOR 10217-138 Drive belt.